Piston rings do more than seal the gap between the piston and the cylinder wall. By preventing exhaust gases from entering the crankcase, these engine components prevent power loss. This is especially important in high-performance engines such as the powerplants used in motorsports. 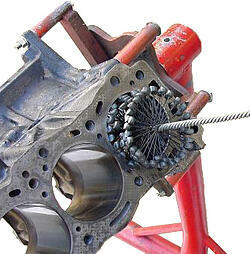 Without a proper fit between the piston ring and the cylinder bore, compression blow-by and oil leakage can sideline the kinds of car used in NASCAR, IRL, and World of Outlaws events. In the racing industry, providing consistent contact between piston rings and cylinder walls usually means resurfacing the cylinder bores. Engine wear is a problem, but it’s not the only one. Today’s high-performance engine blocks are made of much harder materials. Meanwhile, today’s high-performance piston rings are significantly softer and have less tension. For engine mechanics then, it’s impractical to wait for new piston rings to wear into the cylinder walls. That’s why they race engine builders choose Flex-Hone® tools. As an article from Performance and Hotrod Business Magazine explains, flexible cylinder hones from Brush Research Manufacturing (BRM) promote proper ring seating and sealing. In “Rings True”, part of the publication’s Precision Engine section, automotive writer Ed Sullivan describes how BRM’s engine hones “allow for the fine-tuning of cylinder bores”, even in blocks made of harder metals that can make piston ring break-in challenging. Flexible honing tools aren’t designed for heavy-duty material removal, however. BRM engine hones shouldn’t be used for initial honing, cylinder resizing, or geometry correction either. Instead, Flex-Hone® tools are the right choice for imparting a surface finish that promotes engine performance. By braking the “glaze” that forms on cylinder walls, flexible honing prevents piston rings from “skating” over the surface. By imparting a cross-hatch series of oil-retaining valleys, flexible hones support optimum lubrication, too. Flex-Hone® tools are sometimes called “ball hones” because they have abrasive globules that are permanently laminated to flexible nylon filaments. The Flex-Hone® Resource Guide explains how to choose and use ball hones for various base metals, including harder engine block materials. Ball hones are available in 11 abrasive types, 8 grit sizes, and in tool diameters ranging from 4-mm to 36”. They require no special training or instruction, as BRM’s How to Use a Flex-Hone® Tool video shows. The ball hone’s metal mounting stem supports its use with handheld power tools such as electric drills. Self-centering, self-aligning to the bore, and self-compensating for wear, BRM’s engine hones should always be used with a high-quality lubricant such as Flex-Hone® oil. Coarse finishes may require progressively finer ball hones to meet final surface finishing requirements. Flex-Hone® tools are proudly Made in the USA, and BRM works with a network of distributors to meet global demand. 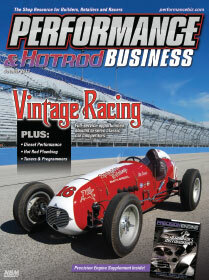 Do your tradeshow plan include a trip to the upcoming PRI Show in Indianapolis? From December 10 to 12, 2015, BRM will be at the Indianapolis Convention Center in Booth #5513. Come see Flex-Hone® technology for yourself, and learn all about BRM’s full line of automotive surface finishing solutions, including our Flex-Hone® for Rotors tools, valve guide and oil line brushes, and parts wash brushes. Make the most of your PRI 2015 experience. Request a meeting with BRM today.